Warsaw City Hall is located at 303 East Main Street, Warsaw, KY 41095; phone: 859-567-5900. Photo: Henry C. Peak House, ca. 1869, 504 Main Cross Street, Warsaw, KY. Listed on the National Register of Historic Places in 1980. Photographed by User:Nyttend (own work), 2013, [cc0-by-1.0 (creativecommons.org/publicdomain/zero/1.0/deed.en], via Wikimedia Commons, accessed October, 2015. Originally known as Fredericksburg the town was platted in 1815. It was renamed Warsaw in 1831. Warsaw replaced Port William as the county seat in 1837. Warsaw, on a level terrace overlooking the Ohio River, was once a prominent river port. A little coal is brought here by boats, and a side-wheel ferry makes cross-river trips to the Indiana shore; but the Warsaw of today depends upon its position as a trading center and county seat for its life. The town boasts that poverty is unknown in it and that its county jail is seldom occupied. The Jail, on the second floor of a small brick building, with thick vertical bars of stone across the front, is sufficiently forbidding to discourage the most obstinate wrong-doers. In the center of the public square is the dun-colored, two-story Gallatin County Courthouse, erected in 1838, with a bell tower. It was remodeled in 1938-39. 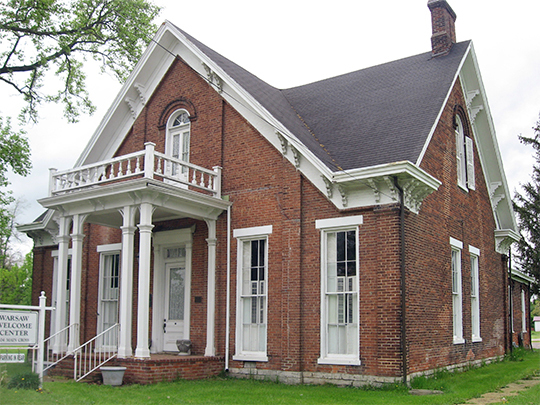 Payne Manor, at the western end of town, overlooking the river, is a brick Greek Revival structure of two stories, painted white, that was built in 1850 by the son of Gen. John Payne, an officer of the Revolutionary War. Four Corinthian columns ornament the small portico, and a balcony is below the front upper story windows. In the hall hangs a painting of the steamer, Jacob Strader, which plied the Ohio in the fifties.